When I saw this foundation was coming out, I was absolutely over the moon. 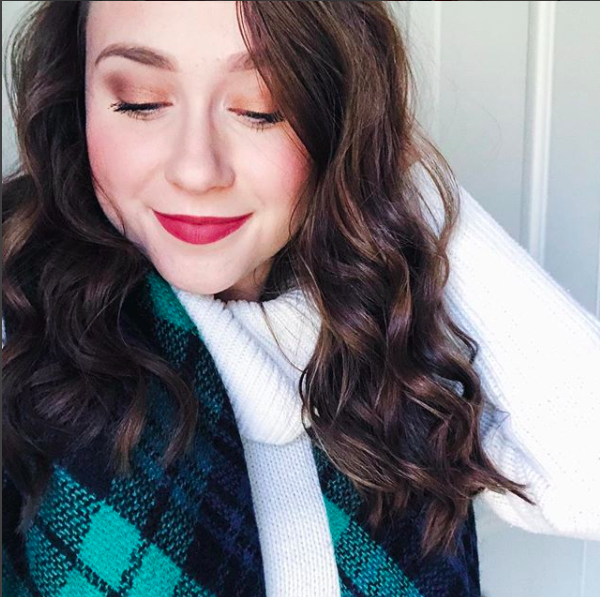 I LOVE the L'Oreal True Match Foundation and the L'Oreal True Match Lumi Foundation, so I had really high hopes for this foundation, and let me tell you, it truly lived up to my high expectations. 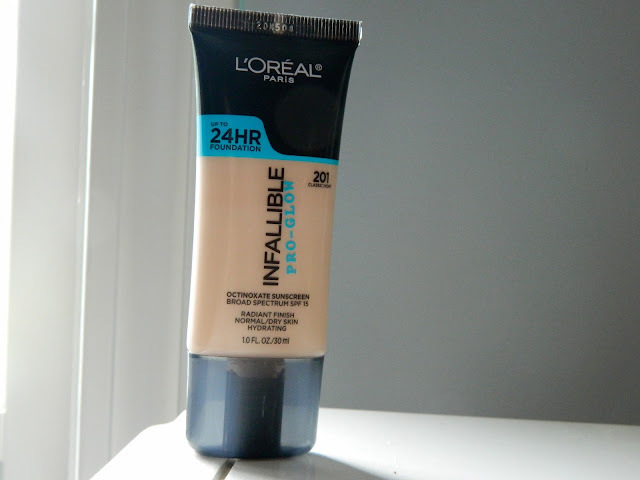 The L'Oreal Infallible Pro-Glow Foundation has quickly become my go-to product, and I've been using it practically on a daily basis now. My biggest concern with this foundation was as follows: would it be the same as the L'Oreal True Match Lumi? Is it even worth buying? Let me tell you, it's worth it. I honestly don't think I'm going to go back to the L'Oreal True Match Lumi after trying this one, because I just like it so much more. First off, this foundation is a lot less tacky than the L'Oreal True Match Lumi. One thing I noticed that sort of bothered me with the L'Oreal True Match Lumi was that I could always feel it on my skin. I try not to touch my face, but that being said, sometimes it happens. There were times when I literally felt like my face was sticky and wet when I would touch it. Now, I still love the True Match Lumi. I know the previous comments sounds a bit contrary, but it did wonders for my skin this past winter when my face was super dry and flakey. Now that I've tried to give you a comparison of the two, let's get into the review. I got the foundation in 201 Classic Ivory (the lightest shade they carry), and it's the perfect match for my skin. They have a great variety of shades, in my opinion. The packaging isn't super fancy, as you can see. I actually really like the squeeze tube in comparison to the True Match and the True Match Lumi. It's pretty compact and it's easy to throw in your makeup bag for a quick overnight. Plus, you don't have to worry about the bottle breaking! This foundation applies BEAUTIFULLY. It's extremely lightweight and you really don't need a lot to get a decent coverage. The product claims to be a medium coverage, but I feel that it's extremely build-able. If you want just a really light coverage, just use a very tiny amount. I usually go for about a medium coverage, but another layer easily creates more of a full coverage look. I've applied it with both a brush and a beauty sponge, and find that it works great with both, honestly. The beauty sponge definitely creates more of a sheer, dewy look while the brush creates a more full coverage look. The product claims to last for 24 hours, however, I can't actually attest to this because I have no desire to wear foundation for 24 hours (who would?). I would say that I typically wear this foundation for about 8-10 hours depending on the day. At the end of the day when I remove my makeup, I can see that it has worn off a bit, however, it wears beautifully. While it doesn't wear off much, it definitely doesn't wear off patchy and gross like some foundations tend to. I'm really impressed with this foundation, as you could probably already tell. I'm very picky with foundations and I don't often switch it up. When I saw this product was coming out, I knew I had to try it though, and I'm so glad I did! I would highly recommend this product for dry skinned gals, but I truly think anyone can use this. Unlike the True Match Lumi, the foundation isn't tacky and doesn't make you feel like a greaseball on a hot day. It gives you an amazing glow without being greasy or oily. Has anyone else tried this product? Thoughts? Thanks love! I'm so glad you enjoyed. It's great to find a foundation that really works for your skin! Definitely go for it! It's inexpensive and works wonders. Haven't tried this, but it sounds pretty impressive! It definitely is :) I was pleasantly surprised ! You definitely should :) it's great! This sounds great, I haven't tried out any L'Oreal foundations in ages! I LOVE L'Oreal foundations. They're definitely my favorite! I've heard so much about this, I really need to give it a go! You definitely should! So glad I did.